American music lost two Georges recently: last week, George Jones died, leaving country music bereft of the voice that almost everyone agrees was, in its beautiful desolation, the finest of the form. There’s doubtless some truth to this view of Shea—as the unprepossessingly powerful vocalist whose gospel singing served as the musical poetry to Graham’s preacherly prose. There’s a certain quaintness to this kind of anecdote, given the enormity of Graham’s subsequent fame (imagine, Billy Graham needing help drawing a crowd!). But it’s worth pausing for a memorial moment to remark on an often-overlooked dimension of the Graham-Shea relationship captured by the story of the young Shea’s drawing power as a gospel star (“people drive for miles to hear him sing,” another early poster boasted). Graham and Shea inhabited the same solar system of evangelistic celebrity, but each man’s career had its own orbit and described its own legacy in the world of commercial ministry. Considered on its own terms, Shea’s gospel career is a case study in the postwar mass-market commercialization of North American Christianity, and how Protestant evangelicalism developed the superstructure necessary to support what we now call contemporary Christian music (CCM). It certainly fit the forthright, just-the-gospel-of-Christ-ma’am Graham aesthetic, but Shea’s propensity for coloring his tones quasi-operatically tended to make most everything he sang sound the same. “I’d Rather Have Jesus” can certainly carry the weight of Shea’s majestic singing. Or perhaps more accurately, Shea’s singing style befits the song. A more rollicking tune like “Leaning on the Everlasting Arms,” not so much. In its most extreme form, Shea’s style of intonation, joined to the idiosyncratic rhythm with which he phrased many of lines, could sound more like a spoken word religious poem than a gospel solo (listen to this clip, and appreciate the yeoman’s work of the pianist and organist in, by turns, keeping up with—and waiting for—Shea’s delivery). This somewhat stentorian dimension to his style can make it difficult to credit any claim of Shea as preparing the way for the likes of Evie Tornquist and other mainstays of the Jesus movement, much less subsequent CCM stars such as DC Talk or Chris Tomlin or Casting Crowns. But what links Shea to the formation of CCM has less to do with his singing style and much more to do with the brand of celebrity he naturalized in evangelical Christianity. Whereas Graham’s fame was—and is and will always be—a product of his preaching, Shea brought an independently established reputation as a professionally successful gospel singer to his work on the Crusades. So the international fame he achieved as Graham’s soloist was, in its own way, wider (though not necessarily deeper) than Graham’s. That’s because, while Graham had faithful followers, Shea had product-buying fans. Even before, and certainly after, his death, it has been a commonly cited indicator of his success that Shea sang to over 200 million people through the Graham Crusades. But the real number to note—the legacy making measure of his star power—is that Shea released more than 70 retail albums with RCA alone between 1951 and his death, and he recorded over 500 vocal solos. At any given time during the height of his acclaim, the best of Shea’s recorded songs were in regular rotation on the playlists of radio stations all over North America (and beyond)—stations whose airtime Graham could only access on a pay-to-play basis. 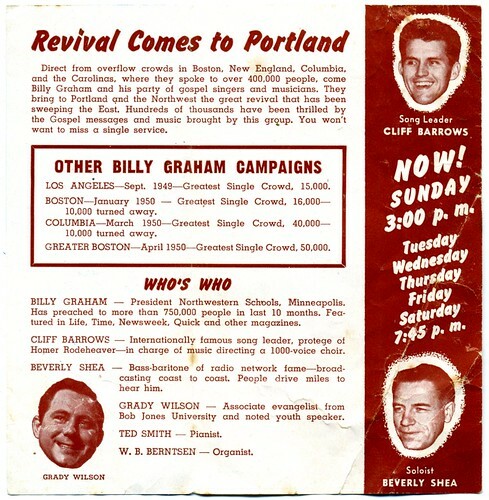 People bought stuff the Graham Crusades were selling all the time, of course, but unlike Graham’s product line, Shea’s music came to function not just as a ministerial adjunct to Graham’s sermons but also as a stand-alone form of commercialized Christian entertainment whose economic infrastructure was increasingly independent of the evangelistic revival circuit. In the process of becoming one of gospel’s first mega-stars, one foot in the world of revivalistic ministry, the other squarely planted in the post-World War II booming Christian entertainment business, Shea modeled what it looked like for a man of God to be fully in the modern world of getting and spending on a vast new scale—to stand bestride the world of Christian music in the age of mass-market reproduction, at least as much as a single man singing traditional gospel songs and hymns could—without being of it. It’s not that Shea was part of something entirely new in being famous or making money off gospel in his role as singing sidekick of an American evangelist. Before Shea, there was Ira Sankey, Dwight Moody’s song director, and Homer Rodeheaver, Billy Sunday’s music man—Sankey and Rodeheaver were both savvy salesmen of their own music and celebrity status. But Sankey’s and Rodeheaver’s efforts in songbook sales and wax cylinders belong to the pre-history of post-modern Christian music super celebrities. The vast domain of Shea’s fame emerged from the intersection of radio’s reach, the proliferation of affordable vinyl records, and ultimately the cultural leviathan of television in an extended period of national economic expansion. Shea’s brand was built on both the pious solemnity of congregational worship, and the warmhearted magnetism of an iconic performer. In this, he embodied a form of Christian celebrity that successfully merged and managed the longstanding tension in gospel between the ministerial and recreational functions of Christian music. Pulling off this merger of ministry and entertainment was trickier than Shea’s avuncular gracefulness suggested. The meteoric rise and scandalous collapse of Aimee Semple McPherson stand now—and stood in Shea’s time—as a potent parable of the promise and peril of twentieth-century Christian megastardom. Graham’s wholesome Brother Billy persona was of course one powerful alternative for middle-class evangelicals who wanted to look up and away from Sister Aimee’s down-market unseemliness. Shea’s success distinguished itself for being both more explicitly commercialized than Graham’s, while also retaining all the bourgeois respectability so often found missing in the tawdriness of the Elmer Gantrified competition—the faith healers and the New Thought movement and the flamboyant prophets of prosperity gospel. Consequently, Shea’s rise represented a much greater movement in the post-modernization of evangelical culture: Shea received the highest honors bestowed by both the commercial world (Grammys and Dove Awards) and evangelicalism’s denominational hierarchy (he was a member of the inaugural class of the Conference of Southern Baptist Evangelists’ Hall of Faith). In short, Shea helped the worshiping faithful understand the purchasing power of Christian consumers as an extension of their piety, as form of devotional practice that encompassed the ordinary pleasures of music entertainment. So the next time you encounter Mercy Me or Michael W. Smith or Gaither Vocal Band, listen closely: there’ll be some of Bev Shea’s grace notes in the mix somewhere.